Riveting of the rear half of the chassis is in full swing. With the end of this lengthy task drawing closer we are now seeking quotations for the fabrication of the bunker in anticipation of being able to locate it in position on the chassis in the not too distant future. 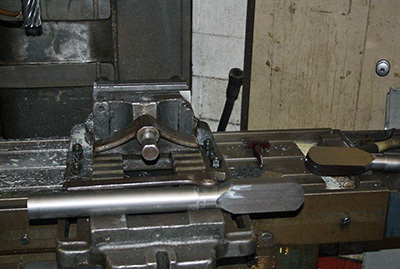 Machining continues on a number of items, axleboxes, keeps, spring links and trailing crank pin nut (RH side). An order has been placed with The Boro' Foundry Ltd. for casting the four pony truck wheels. Work at Buckfastleigh on the driving wheels continues on the crank pin aspect and over at Williton both of 82045's new cylinders have been espied during their recent Spring gala awaiting their turn on the machine. This year's Annual General Meeting proved to be another pleasant and upbeat occasion, with Chris in the chair and a total of 58 attendees. We were able to report on a year of good progress and to outline plans for the next twelve months, which should see a dramatic change in the appearance of the locomotive, with driving wheels and cylinders to be fitted and bunker fabricated, mounted, painted and lined-out. The second phase of the Boiler Appeal is in the process of preparation, and we hope that a full-length feature article, accompanied by an appeal leaflet, will be published in one of the national magazines in the next few months, the intention being to spread the appeal to a wider audience, beyond the SVR. The initial launch of the Appeal has met with an excellent response from SVR members, with sufficient money already in the kitty to fund the boiler barrel, smokebox and front tube plate. We know that the Belpaire firebox - in particular the copper inner skin and firebox tube plate - will be the most expensive items, and are at present awaiting costings for both copper and steel components so that we can produce a realistic schedule for building the boiler. We do not intend to purchase the copper until it is needed. Peter Kirby - One pony wheel. Two more members said that they would be prepared to sponsor the bunker, so I'm hoping that next time we offer one of the items of the loco's superstructure, they will feel able to respond. It's clear that we have some fantastic supporters - thanks, gents, all. Does anyone fancy a smokebox? Have a word with Chris if you do. Barbara remarked, after the AGM, "Three wheels on my wagon!" thus giving away our collective vintage as I think this was the title of a 1965 Top Ten hit for Barry McGuire, which means that it dates from the days when the 82XXX class was still almost intact and running on BR. Anyway, the upshot is that Tony has placed the order to have the pony wheels cast, although we are, strictly speaking, still a wheel short - so to speak! If anyone would like to sponsor the fourth, please get in touch with Chris. Cost is a whisker under £2,500, but for a UK taxpayer, £2,000 would cover it perfectly, as we could claim Gift Aid at 25%. 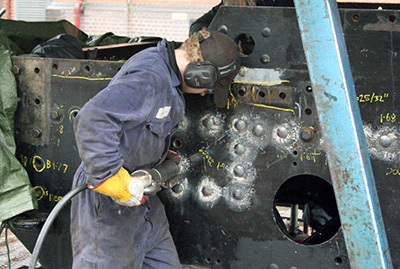 SVR boilersmith and 82045 member Ross Cooper riveting stretchers into the main frame plates. One of the spring link forging partly machined.